The colored dresses were made using Simplicity's costume pattern #5041, for those wondering. I am very glad to be able to help others find your blog through mine! I commend you ladies for knowing who you are and sticking with high standards. Hello, Maidens! 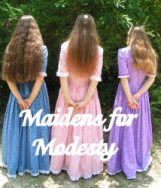 I'd very much like to be a "Maiden for Modesty," too. I've included the image and link on my new blog. Please add me to your directory at your convenience. Thank you & God bless! Looks like no one has commented for a while. I just wanted to let you know, someone's still taking notice of your blog, and I'm sure I'm not the only one! Thanks for taking such a stand for modesty in a culture who prefers otherwise. Feel free to check out my blog as well if you'd like. God bless all of you! I put you as a widget on my blog. Awesome! I'm so happy to see all these modest women here in one place! I am adding you to modest (as in tiny!) blog at callingmother.blogspot.com. It's actually a blog about answering the call to be a mother. I was wondering How old are you girls! Do you have an email? Are you LDS or just Christian? This is a wonderful blog!! Aubree: This blog is no longer active (hasn't been for a few years) as we're now both 22, Anna's married and Miriam's engaged, in new seasons of life. We are Christian. Glad this has encouraged you! As far as the other posts where links didn't work, it looks like the info has been taken offline. Sorry about that!